Educational Researcher 2014 43(1): 7-8. Educational Researcher 2014 43(1): 9-11. Educational Researcher 2014 43(1): 12-14. Educational Researcher 2014 43(1): 15-18. Educational Researcher 2014 43: 19-23. Educational Researcher 2014 43(1): 24. Educational Researcher 2014 43(1): 25-36. Educational Researcher 2014 43(1): 37-44. 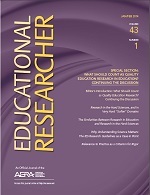 Educational Researcher 2014 43: 45-54. Educational Researcher 2014 43: 55-56.